The MAX ‘99’ mobile base platform is the mobile robotics platform of the future. The base comes with two 12-inch diameter (30cm) decks. It features dual casters and dual drive motors making it very stable. This robot will turn on it own axis making it very maneuverable. Each deck base is 12 inches in diameter (30cm). Set of (4) 10" Deck Brackets. The base has dual 12 volt 20in-lb torque drive motors (The Max speed is 39 feet per minute under full load). The drive wheels are six inches (15 cm) in diameter. Each caster wheel is three inches (7.5 cm) in diameter. 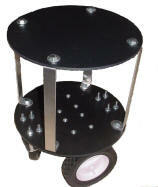 The base is balanced with two casters. The maximum recommended payload is 35 lbs. (13.6 kgs. ).